Operating Era: 1910-1952. Norfolk & Western. 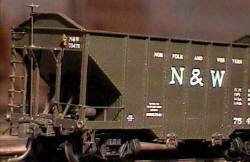 N&W acquired 4,000 class HM hoppers in 1910, 4,000 class HP in 1911-15 and leased another 4,000 HP's that became railroad property in 1924. The HP's were 9-1/2" higher than the HM's and were built with safety appliances. Otherwise the two classes were essentially identical. The cars were the major workhorse of the coal fleet for several decades and, with rebuildings, lasted into the 1950's. 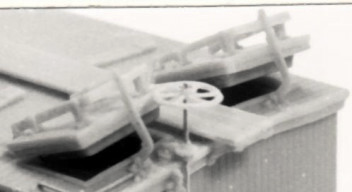 The HP class as delivered had flat triple hoppers operated by chains and ratchet wheels, a holdover from wood car design of the previous century. The cars were extensively rebuilt during 1923-32. 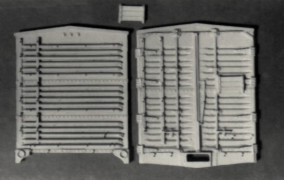 Previous class HM cars were resheathed to HP height in 1923-5 becoming classes HMa, HPa and HPb. HMa/HPa retained the triple hoppers. HPb and all subsequent classes received twin hoppers. All classes received peaked end extensions that were riveted on to the top of the end sheets. Class HPc rebuilt HP's in 1927-32 with power handbrakes, the only subclass to receive them. Class HPd rebuilt HP's in 1928-29 to look almost identical to HPb's but with a different rivet pattern at the hoppers. Each class received slightly different lettering which became uniform in 1934. The cars ran until rebuilt to class H-1 in 1939-41.